Bexley Bariatric Heavy Duty Bath Board Easy To Use. The Bexley Bariatric Bath Board will accommodate users up to 200kg in weight, or about 31.5 stone. Heavy duty steel and plastic construction provides support, comfort, and drainage. It can make bathing both easier and safer for those with bariatric conditions. 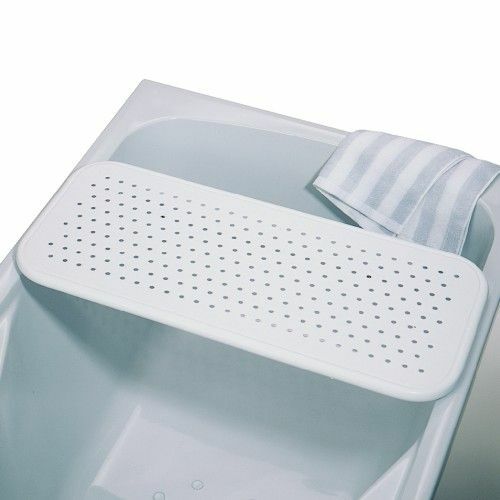 This bath board is just over 26" inches wide and will adjust to fit most standard bathtubs. Users may find it comes in handing while bathing and it'll certainly make getting into and out of the tub easier and much less risky. This bath board offers just what we need. My partner is not heavy, but wanted a substantial board without slats and with good-sized sitting area. He uses it to sit and rest while showering and as a tool to get out of the bath - he carefully swings each leg round over the side of the bath while sitting on the board and gets up from there - much safer than doing it standing. We are very happy with this purchase.